FRISCO, Tex. – Dallas Stars General Manager Joe Nieuwendyk announced Thurday that the club has signed free agent defenseman Karlis Skrastins to a two-year contract, worth $2.75 million ($1.1 million in 2009-10 and $1.65 million in 2010-11). Skrastins, 34, skated in 80 games for Florida last season, collecting four goals and 14 assists for 18 points with 30 penalty minutes. His assist and point totals in 2008-09 were both career highs. 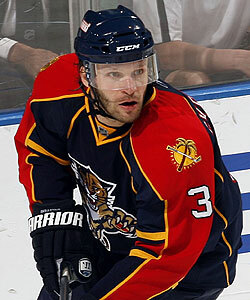 He led the Panthers with 171 blocked shots, ranking ninth overall in the league in that category. The 6-1, 210-pound defenseman has blocked a total of 673 shots over the last four seasons, averaging 2.32 blocked shots per game. Skrastins ranked seventh in the league with 190 blocked shots in 2006-07, and ranked second in the NHL with 207 in 2005-06. Despite missing 22 games in 2007-08, he still managed to block 105 shots, ranking third on Florida. Skrastins has skated in 679 career NHL games with the Nashville Predators, Colorado Avalanche and Florida Panthers, posting 27 goals and 88 assists for 115 points with 313 penalty minutes. He also appeared in 20 career Stanley Cup Playoff games, all with Colorado in 2004 and 2006, recording three assists and 12 PIM. Originally drafted by Nashville in the ninth round (No. 230 overall) in the 1998 Entry Draft, Skrastins holds the NHL record for consecutive games played by a defenseman – 495 straight games from February 2000 through February 2007. A native of Riga, Latvia, Skrastins has skated for his country at the 2002 and 2006 Winter Olympic Games, and has appeared in the World Championships on nine occasions, most recently 2009.